Melatonin is a natural substance secreted by the pineal gland in the brain. Recognized as a key element in regulating the body’s daily metabolic rates, melatonin is synchronized with our biological clock and dictates changes in our metabolic activity. 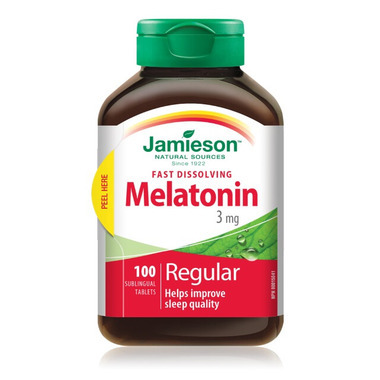 Melatonin also acts as an anti-stress agent, a night-time restorative, an immune booster and it provides the body with antioxidant protection from free-radical damage. Irregularities in melatonin production can cause sleep problems, lethargy and mood disorders. With age, melatonin production can become sluggish. The total amount of melatonin decreases substantially and the day-night cycle becomes less pronounced. Such deficiencies cause sleeplessness, and the melatonin needs to be replenished for sleep to be optimally restored. 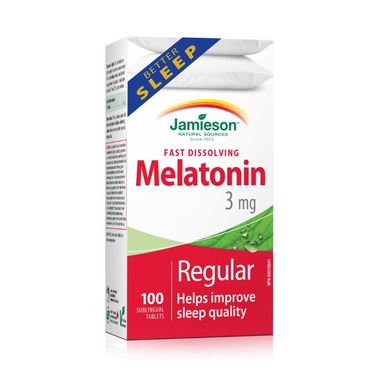 Jamieson’s Melatonin 3 mg Fast-Dissolving Tablets are derived from a non-animal source for guaranteed safety. Each tablet dissolves quickly and is absorbed immediately by the body so you can sleep fast! Excipients: Mannitol, Dextrose, Cellulose, Crospovidone, Calcium Carbonate, Xylitol, Dicalcium Phosphate, Vegetable Stearic Acid, Vegetable Magnesium Stearate, Silica. Works well. No drowsiness the next day. Canada's Jamieson always gives you the best quality for the best price IMO. With this product I actually sleep through my husband's snoring, wake up rested and ready for the day, with no drowsy, cloudy-headed feeling. Its non-addictive, too, which is important to me. 5/5! I was amazed at how well this works! Works great! I take it sublingually and helps me get deep, restful sleep. Great stuff! Dissolves under your tongue, sleeping within 20 minutes, wake up feeling great! This is a great product put it under your rouge dissolves and I swear 15 minutes later your sleeping ad wake up feeling great!!!! This product is very easy to use and I believe that it makes a difference in my ability to sleep; very important when you enter menopause! The product is sublingual - you put it under your tongue and let it dissolve. Their are no directions on the box as to how you administer these leaves. Surely you do not put it on your tongue ? If dissolving in water then ho much water?